For those of you who missed it, Liz and I had a liveshow once again for last month's Legend discussion (something we're going to continue, because we love how many of you drop in, and we really love that it allows people who aren't able to make it still participate); at the end of that liveshow, we held a blind voting for this month's pick! Basically, we each chose a book that we wanted to read, and we let you decide which it would be, BUT we didn't show you the covers or tell you the titles/authors. Instead, we each read a small excerpt from the beginning, and let you vote on which intrigued you most. As I said, we'll be having a liveshow to discuss this book at the end of February, but this time it will be on my channel, BookRatMisty. But you can also follow along on Twitter, as always, with the hashtag #WednesdayYA. It will be held Wednesday, February 25th at 8:30 EST in both venues, and we'll tweet out the actual link to the live streaming discussion that night. 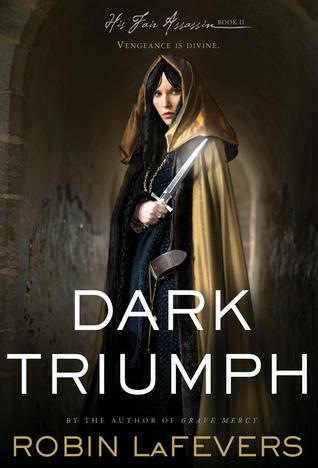 So if you've read Dark Triumph or have been wanting to, we definitely hope you'll join us in discussing it at our liveshow! I haven't read the first one, so I probably won't be able to read this by the discussion date, but it sounds like a great book and a fantasy series I'm missing out on.